On April 6, my family officially became a Family of 5! Although we have been functioning that way for several months, it was meaningful and symbolic to move forward together. Since the beginning of our journey with our girls, we have received an abundance of support and encouragement from friends and family near and far. This has been a true gift to us. In addition to that, I have also been asked one question more than any other, so I thought I would answer it here. Nothing negates the simple answer, but if you have a little more time and you genuinely want to know, I can dig a little deeper. Because honestly, life is good, and it is also more than that. Life is hard. I have three kids now, so… there’s that. I became a mother of three in an unconventional way, and I am still figuring it out. They are so opinionated. And hungry. And human. And just when I think I have one figured out, that kid goes and does something completely unprecedented, and all bets are off. Life is hard, yet rich with insight and perspective. Another thing I may tell you if I am being honest is that I am seeing very clearly that hurt begets anger, fear begets hostility and grief begets emotional unrest. When I remember this, I am filled with compassion for my children (and even myself), but when I forget this, the initial hurts, fears and grief beget anger, hostility and emotional unrest in me, too. I realize all too often that there are actually 5 wounded children in our house, not just three. My wounds are not like my children’s wounds for many reasons. I don’t pretend to compare my life to theirs. But I am a broken, wounded child, too. I am looking for someone to take care of me and defend me and take on my burdens because, even though I am a grown-up, I feel very small sometimes. In these moments, I may call my mom or my sister and lament, or I may communicate through my facial expression to my husband to just hug me and tell me everything will be okay. Sometimes, although not often enough, I remember that I have a Creator who loves me and cares for me in ways I cannot even understand, and I want my children to feel comforted by that, too. Because I will let them down. I already have thousands of times. And I feel like crap when I do it because these are kids that have already dealt with so much disappointment. I want to come through for them, but I can’t do it all the time. I can’t even do it half the time. So life is good, and most days, life is overwhelming. After adopting our son almost 4 years ago, I knew that adoption would always be woven intricately into our story, and I honored that. It felt good and right for our family to embrace the adoption narrative. But this feels different. I can’t tell my daughters that it is their story to tell like I have told my son for years. Although it is still their story to tell, the world feels entitled to know it. They ask questions in front of my children or to my children about their stories. Personal questions. Complicated questions. And they expect answers. It’s like they are asking me where I got my purse, and if I refuse to provide the information, I am seen as stand-offish or rude. But it’s not a handbag. It’s my daughter’s past. It is pain and hurt that cannot be summed up in a quick response, but somehow, it needs to be. I don’t know what is worse: grown-ups asking my young black daughters about their white mom or grown-ups asking me in front of them about my young black daughters. So life is good, and life is uncomfortable. So there it is. Life is good. Life is hard. Life is overwhelming. Life is uncomfortable. And life is very sweet. On Mother’s Day, a day that is not simple for any my children or for me, we decided to get away. We took a day trip to the beach, our first one as a family of 5, and we let the beach do what the beach does. We let it soothe us and embrace us. We let it heal us and renew us. As my husband and I stood on the shore and watched our three children play in the waves together, laughing and unencumbered, I felt deeply connected to and grateful for my family and my life. As a dear friend reminded me recently, a meaningful life is much richer than a happy one. And the beauty is that when I seek meaning and connection more than ease and comfort, I experience more contentment and peace than I do when happiness is my pursuit. Honestly… It gets richer and more meaningful by the day. 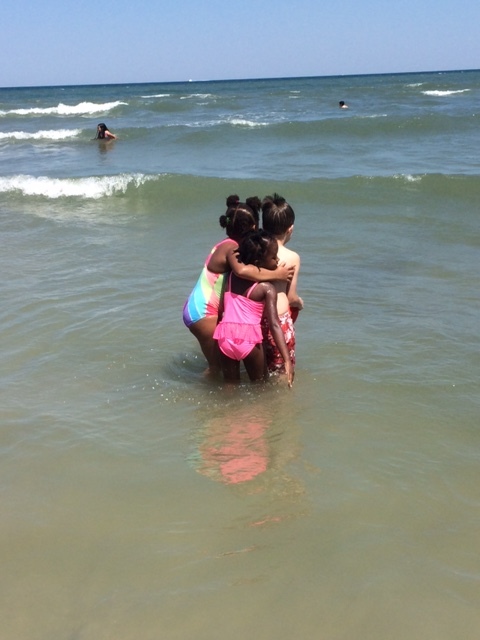 This entry was posted in Adoption, Faith, Family, Meaning and Purpose, Motherhood, Personal Growth and tagged adjustment to adoption, adoption through foster care, beach trip, Mother's Day, transracial adoption on May 16, 2016 by karinfields.